Ninja Foodi meatloaf is the bomb! Juicy in the center with a crispy barbecue sauce on the outside. All cooked in this pressure cooker and air fryer machine. You’ll find more Foodi air fryer recipes here too. Join my EASY Foodi Recipes Facebook group for more recipes. 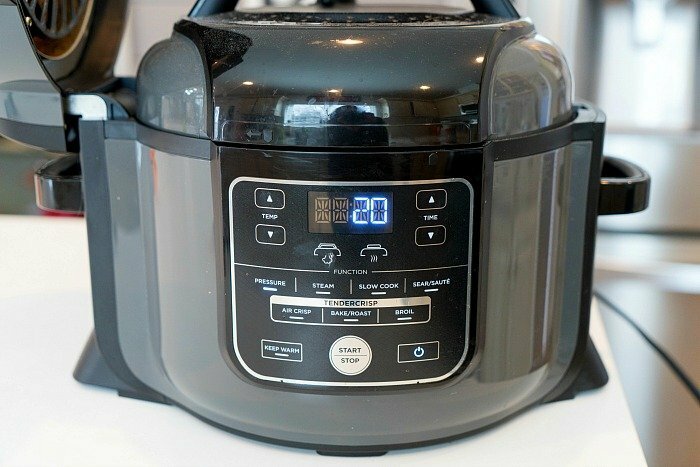 You are going to use both Ninja Foodi pressure cooker and air fryer functions for this recipe. Keep in mind the timing below cooks the meat so there is no pink left. If you like yours less done adjust timing accordingly. Then you’ll drain the water inside your pot, return the basket with your meatloaf inside and pour barbecue sauce on top. Cose your air fryer lid. That is the one that is attached. In 8-12 minutes the outside of your meatloaf will become wonderfully crusty like we like it here. This is subjective so if you like it really crispy you’ll set closer to 12 minutes, or less if you just want a tad. Why is this the best way to make meatloaf? This quick meatloaf recipe requires no preheating of the oven at all. Perfect when it’s hot outside and you don’t want to heat up your house. It is healthier because the fat drains away from the meat in the pressure cooking process. There are holes at the bottom of the air fryer basket used. You can adjust how crunchy the outside gets easily. The air crisp lid can be lifted up and checked often so it doesn’t burn. Adding more time is as easy and pushing a button. Are you ready to try it now??!! Seriously, it is the only way we make meatloaf anymore. Forget the loaf pan in the oven, this is a game changer!! Looking for more easy Ninja Foodi recipes? Pressure cooker frozen chicken wings, then air crisp to make them crunchy on the outside! 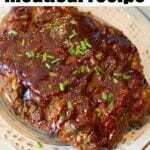 Need other ways to make meatloaf? 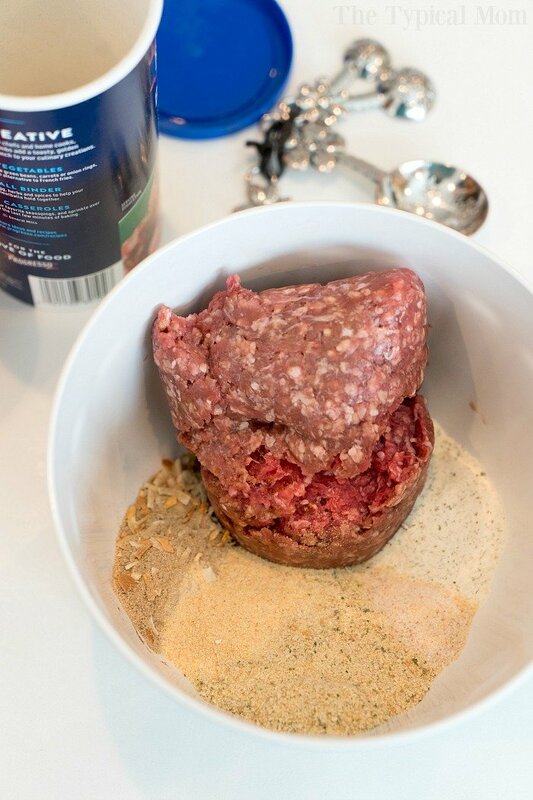 Mix together all ingredients in a bowl until all powder is incorporated well into the meat. Form into a round or oval pattie with the same thickness all the way around so it cooks evenly. Add 1.5 c water into the inner pot of your Foodi. 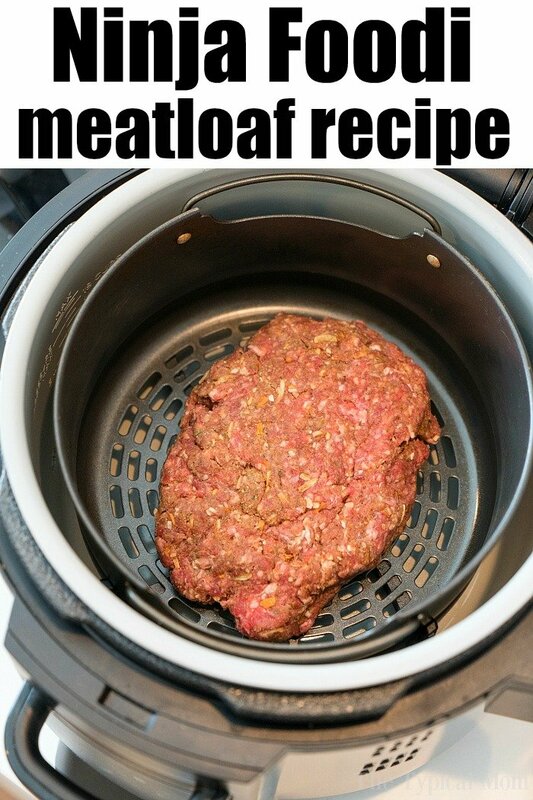 Place meat into air fryer basket and lower that into your inner pot. Close pressure cooker lid (one that isn't attached) and then turn Foodi on. Press pressure button, high, for 25 minutes. Allow to naturally release steam for 5-10 minutes. Then release rest of steam. Remove lid, pour water out of your inner pot, and pour barbecue sauce on top of your meatloaf patty. Sprinkle green onions on top if desired now. Close air crisp lid (one that is attached). Press air crisp button, 390 degrees for 10 minutes. Then remove meatloaf, slice and serve! 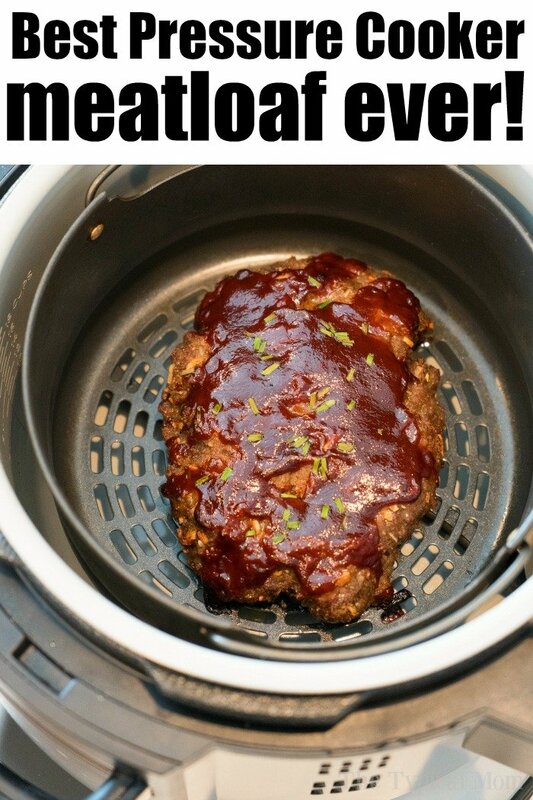 Awesome idea using the Air Fryer for meatloaf! Thanks for sharing! I love both the Instant Pot and Air Fryer but I never thought about using them together. The Ninja Foodi system with both in one sounds like a real time and space saver. 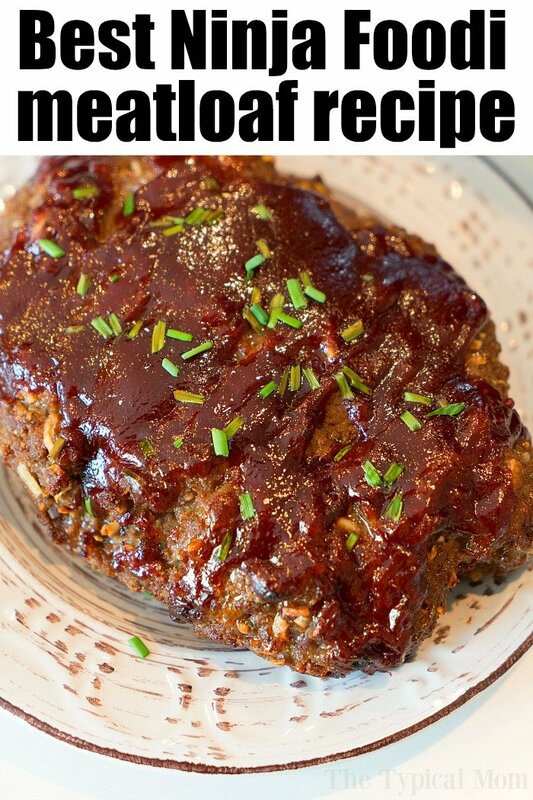 The meatloaf looks delicious and I’m one of those people that love the outside crispy so this is definitely for me.